This is our brand new 2'' Hitch mount bike back carrier for cars, trucks, SUVS or minivans which can haul up to 2 bicycles. It will firmly hold the bikes, so it's perfect for you to carry your bike. 【Stable & Durable】Our bike hitch mount is made of heavy-duty cold rolled steel construction, 2" diameter of main support, compatible with any 2" hitch receiver. 2.8mm thick of steel tubes, sprayed with black paint to resist rust and corrosion for added durability. 【Easy To Use】Goplus hitch mount carries up to 2 bicycle quickly and safely. Simply assembled and attached to the receiver hitch and you are ready to start use. Compatible with most bicycle frames with adjustable (sliding) tire fixer and individual ties. 【Safety Design】Upright ratchet arms easily adjust to different bike frame sizes, 6 securely straps for each bike to ensure firmly holding. 【Portable & Lightweight】This bike hitch rack mount weights only 19lbs. Easy to lift up with one hand. Very convenient for carrying and storage. You can just put it into your trunk when not in use. 【Protect Your Car】When you carry the bike rack on your car, the rack will keep 12" inches away to protect paint of the vehicle. View More In Car Racks & Carriers. If you have any questions about this product by Super buy, contact us by completing and submitting the form below. If you are looking for a specif part number, please include it with your message. 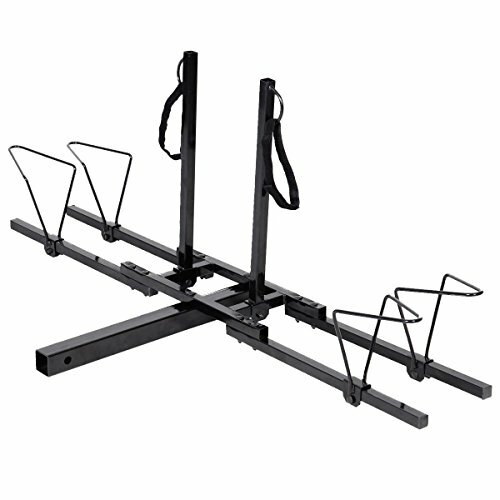 Kayak Rack by Vault Cargo – Set of Two Kayak Roof Rack J-Bar Racks that mount to your vehicle’s roof rack cross bars. Folding Carrier For Your Canoe, SUP and Kayaks on your SUV, car or truck.